Every year the student RAG team put on the Campus Colour Dash. Don your brightest whites and run this explosively colourful race whilst navigating our obstacle-filled course and dodging powder paints. All in aid of Brain Tumour Research. Come get messy! A registration fee will include your very own white Campus Colour Dash t-shirt. Mark Hedley and William Shaw were approached by the University to create five donation boxes for charity. The first completed box was unveiled at a Brain Tumour Research Centre of Excellence tour at the University in November 2016. Will - 'Design is something that I have always wanted to do. My family are involved with design; we are a very creative family. I wanted to certify it and go into design in the future'. Mark - 'It is the first time we have worked with clients. I had never actually done anything like this so it was very interesting. Following this through has been an interesting and educational process'. Four more boxes are due for completion in 2017 and will be placed at cafe's throughout the University campus. "It was a fun packed day which everyone involved felt proud and pleased to be part of. The amount raised exceeded expectations from us all ,and it has spurred us on to do more to help fund a PhD student and keep John McMahon's memory alive. We had overwhelming support from staff across the campus who fully supported our efforts and cause. Many thanks to all who contributed." University of Plymouth Staff Cleaning Team continue to raise funds in John's memory. 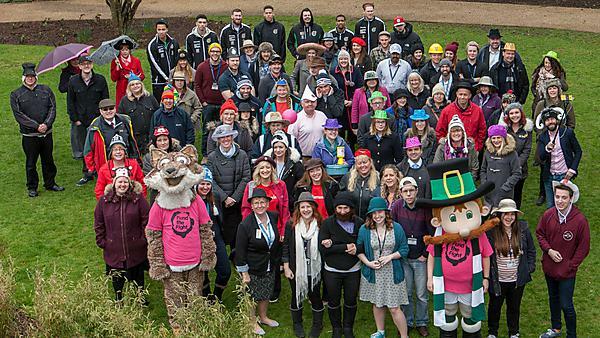 Every year, the charity Brain Tumour Research encourages everyone and anyone to doth a hat for Wear a Hat Day to raise awareness about the woefully underfunded area of cancer research. The event takes place during Brain Tumour Awareness Month in March, and last year events around the University raised over £7,000 towards brain tumour research.